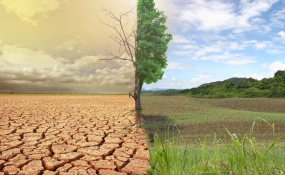 Awka — A Nigerian health research group, Nigeria Working Group of the Canadian Coalition for Global Health Research (NWG-CCGHR) has said that danger is looming in Nigeria as a result of the devastating effect of climate change. The group said except concerted efforts in ending the harm on the environment is intensified, Nigeria and her citizens may fall to bigger devastation in the near future. The convener and Chairperson of NWG-CCGHR, Dr Ngozi Joe-Ikechebelu, stated this during a one day open forum discussion with the working group members and resource persons, adding that the southern part of Nigeria mostly keeps witnessing increasing number of physical buildings which is an obvious evidence of deforestation, which can aid climate change. Ikechebelu said: "Climate change is real and true as revealed in the video documentary that we watched. The documentary exposes a grim picture of the devastating effect and impact of the climate and environmental changes in Nigeria. "This is a wake-up call to individuals, communities, civil society organisations, the state and federal governments that there is a looming crisis. Climate change spans across all regions and is affecting every of its citizens. "The latest report of the intergovernmental panel on climate change that was released by the first week of October 2018 revealed the dire consequences of global warming through more extreme weather, rising sea levels and diminishing Arctic sea ice, among others." She further explained that the recent flood disaster in Anambra State that has sacked many residents from their homes and caused them to relocate to internally displaced camps (IDP) are all evidence of climate change. "This is the physical reality for Nigeria in its quest to attain the sustainable development goals (SDG) set by United Nations General Assembly. "There must be commitment to approaches in line with the Paris accord, of which Nigeria signed towards nationally determined contributions in 2015. "Nigeria government signed to end gas flaring by 2030; transform the country's transport sector by replacing cars with buses; instituting a nationwide climate smart agriculture; installation of off grid solar of 13 gigawatts capacity; achieving 30 per cent energy efficiency nationally; massive reforestation across regions; and improving the electricity grid," she noted. A resource person at the forum, Moussa Maggasa, regretted that environmental degradation has been the bane of African society, saying that his village in Senegal is worst hit as no crop grows in the area. "In my small village in Senegal, when you farm, there is no rain, when there is rain, there are no crops. All these are what we caused to ourselves and that is the resultant effect of poverty, hardship and injustice in Africa," he said.